Who's testing whom? When Kris Kelvin arrives at the planet Solaris to study the ocean that covers its surface, he is forced to confront a painful, hitherto unconscious memory embodied in the living physical likeness of a long-dead lover. Others examining the planet, Kelvin learns, are plagued with their own repressed and newly corporeal memories. Scientists speculate that the Solaris ocean may be a massive brain that creates these incarnate memories, its purpose in doing so unknown. The first of Lem's novels to be published in America and now considered a classic, SOLARIS raises a question: Can we truly understand the universe around us without first understanding what lies within us? I don’t really know how to talk about Solaris. It was a fascinating book with strong philosophical insights, but it was also utterly depressing, and it might not have been the best moment for me to read it. The plot is basically about a crew falling apart during what should have been an exploration of Solaris, a planet covered with a gluey ocean which might also be its sole “inhabitant”. Kris was supposed to join the team but as soon as he arrived, he realized all experiments are on stall. The two other scientists behave oddly, refusing to talk or to even meet him. Very soon, Kris discovers what might be “ghosts” in the station: people from memories who couldn’t possibly be there but reappear incessantly beside the crew members. Solaris starts like a horror story: there’s a feeling of unease and danger creeping in right from the start. Pretty soon Kris panics, loses temper, shouts out, breaks things. I was pretty sure all this was going to turn into a survival horror either between the men, either against the weird “ghosts”, but it didn’t. Instead, we watch Kris trapped in the station, trying to make sense of what can’t be, then trying to understand what is off limit to his intellect, then arguing about how totally hopeless and pathetic the human specie is. They realize the problem is their own human mind: facing a non-terrestrial situation put a huge distress on each of them since they have absolutely no way to relate or understand it, let alone influence it. In an inhuman situation you’re trying to behave like a human being. That may be admirable, but it’s also futile. So Solaris is a sort of philosophical tale about human limitations. One of the central issues in the book is that the three men not only can’t manage to communicate with the ocean, whom they suspect is sentient, they are not really sure what is communication anymore. They realize they had expected to find aliens who could actually communicate in a similar way, involving one of our five senses and with ideas to convey. This big ocean doesn’t feature any of this, it doesn’t look like human people. We’re not searching for anything except people. We don’t need other worlds. We need mirrors. Solaris also critiques the rush toward technology while humanity hasn’t grown wise enough to make the best of it. There is this idea that Science is just another religion. The possibility of contact with aliens, a new Faith. Solaristic science, a new form of anthropomorphism applied to extra-terrestrial beings. Solaris is rather slow paced and it can get lengthy with the minute details of the phenomenon witnessed on the planet. However, it’s a very original take on our condition and limitations as humans. 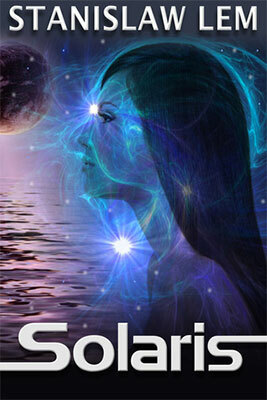 If you enjoy philosophical novels like Flatland by Edwin A. Abbott, you’ll be undoubtedly be interested in Solaris. Next stop is Portugal, on the 18th of August! I think I’ve said it before but I love this world tour idea 🙂 Might join in soon!